On the one hand, a vast sea of old planes parked in the Arizona desert, all decommissioned and/or mothballed or even being gutted and dismantled – hence the informal designation 'boneyard'. It's a unique type of encounter with the USA's Air Force superpower status. A more conventional encounter is the Pima Air & Space Museum next door, which features a wide range of all manner of aircraft in more or less good shape, including some real biggies such as strategic bombers, amongst them three (!!) B-52s. More background info: AMARG stands for "Aerospace Maintenance and Regeneration Group" … formerly known as " ~ Center" (hence AMARC – and you can still find it referenced under that slightly different acronym). It's a facility where the US Air Force stores and guts decommissioned military aircraft and other objects, such as missiles. The "309 Group" in Tucson, Arizona, as the division's official designation goes, is the largest such place by far in the USA (if not the whole world). It's not only old planes past their service life, even fairly new ones can end up here, but the bulk of the countless strategic bombers parked here were taken out of service in accordance with arms reduction commitments achieved in particular towards and after the end of the Cold War (e.g. START). So a pretty large proportion of the planes put here are B-52s as well as quite a few more recent B-1s … though some of the latter may actually be brought back into service. The bombers are at least equalled in number by all those mid-air tanker planes that are so crucial to maintaining a global striking capacity too. Cargo planes, mainly of C-130 Hercules type, are quite numerous too, as well as various smaller fighter jets. In general, not all planes dumped here are for scrap. Many are only mothballed. This accounts for the strange look of so many of them, covered in white, as if painted or sprayed over in whitewash. This isn't far from the truth. Indeed, it is in particular the cockpit windows/canopies and other openings that are covered in white, namely in order to keep the heat out. In the summer, temperatures under the relentless Arizona desert sun can rise to well over 110F/45C in the shade. Inside uncovered aircraft cockpits the temperatures could reach nearly boiling point … and that would obviously not be good for all the electronics and so forth. On the other hand, it is precisely the extremely dry desert climate that is so conducive to storing all these planes out in the open here. There is so little moisture around, and rain is extremely rare, that there's little to worry about in terms of corrosion. And for things made out of metal that is naturally the main concern. The AMARG complex does not only serve the US Air Force, they also accommodate planes from NATO partners. When I was there a fleet of recently arrived Norwegian Air Force C-130 cargo planes filled one section of the plain. Nor is the facility merely a scrapyard for left-over Cold War era junk. In fact it is a profitable operation. I was told it is indeed the only branch of the USAF that doesn't just cost money but actually makes a profit … namely through the sourcing and selling-on of spare parts. 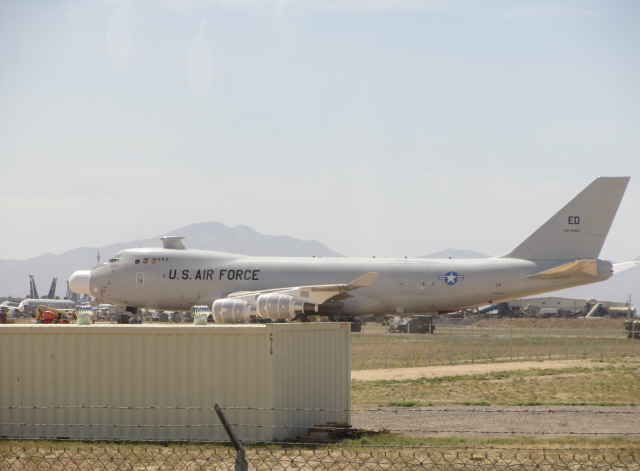 The AMARG complex is right next to, and technically speaking part of, the quite active Davis-Monthan Air Force Base, so you'll see lots of currently serving military planes in the air as well – or hear them from afar. When I was there, a squadron of the German Luftwaffe's Panavia Tornado jets were there for some NATO group training … and these 1970s-design supersonic jets are infamously noisy buggers. They were even loud enough to wake you up in downtown Tucson when they started taking off at 7 or 8 in the morning! 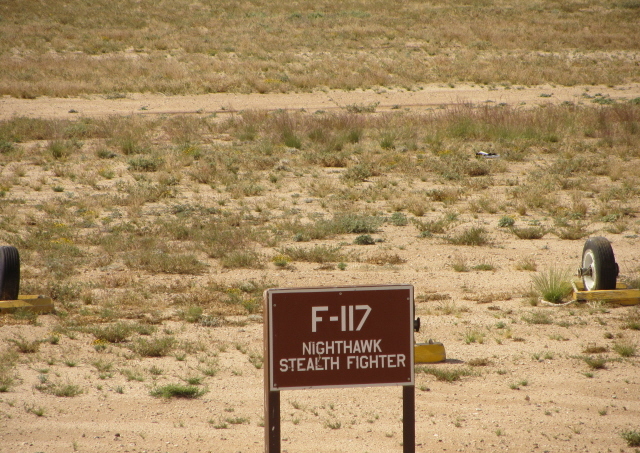 Normally, however, Davis-Monthan is home in particular to A-10 anti-tank ground attack fighter planes. So they're the type of planes you see the most circling the skies here, usually in pairs. 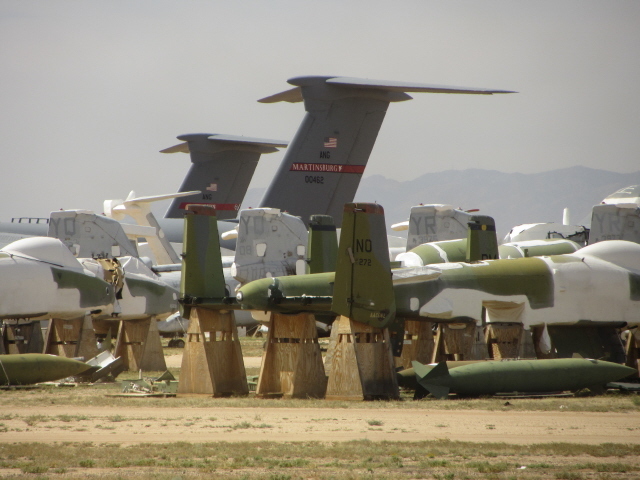 The fact that visitors are allowed to see the "boneyard" of planes within an active air force base is thanks to the special ties the Pima Air & Space Museum has with the base. Guides on the tours are often ex-members of the USAF. Still, it is entirely at the military authorities' discretion that the bus tours are allowed. So you can't really complain about all those security measures that apply (see below). The museum's name derives from Pima County, itself named after a Native American tribe of the region. It lies within the city boundaries of the county's capital city, Tucson. What there is to see: After leaving from the departure point at the Pima Air & Space Museum, the 'boneyard' tour bus first takes the public road that slices right through the middle of the vast AMARG grounds. Driving on this road, incidentally, is the only way of catching a glimpse of the complex without going on a tour. But you'll only see the planes through fences and never really close up. So it does make a lot of sense to go on a proper tour. The bus checks in at the guarded gate to the base, then the tour proper begins. The first stretch takes you past vast numbers of parts of planes rather than whole ones, in particular extracted fighter jet engines, some out in the open, others in special containers. Some ICBM missile parts were to be seen here as well …There are also already rows of complete planes, such as dozens and dozens of F-16s, their tops and cockpit canopies covered in white to protect them from the intense desert sun – so they look a bit unreal, like unfinished plastic model kits. The main port of call on the AMARG tour, however, is what they refer to as "Celebrity Row". Here, a number of planes of different types, usually just one each, are put deliberately on display for visitors. That is to say, these planes are not actually part of the regular AMARG operations, they are rather museum pieces – and all with little panels in front of them indicating the type of plane. As such they are presumably on more or less permanent display – unlike the constantly changing stock of planes in the rest of the complex. "Celebrity Row" includes specimens of some famous designs such as the F-14, F-111 and F-15 – all arguably amongst the sleekest and aesthetically most pleasing-to-the-eye USAF fighter jets ever designed. But not all planes here really came to any "fame" – for instance the YC-14 transport plane design by Boeing which was once supposed to replace the standard C-130s, but which never entered production. This is the second of only two prototypes. The other can be seen – in a bad state – at the Pima Air & Space Museum. At the end of "Celebrity Row" the bus heads south – that is: away from the rows of B-52s you can make out in the north, so you won't see the amassed brutes of this particular type all that well on the boneyard tours … but you do get a brief glimpse of a couple of them, and quite a good view of various B-1Bs too. You have to remember, though, that what you get to see outside "Celebrity Row" is constantly changing, as older planes are taken apart and new ones come in. When I did the tour in April 2012, I was kinda lucky to see some exceptional big planes that had just arrived recently. In particular there were a dozen or two of C-5 Galaxy military cargo planes – the biggest ever built for the US Air Force. Another biggie to be seen was a total one-off: an experimental version of the 747 Jumbo Jet adapted to carry a laser gun in its nose. This development (called YAL-1) was part of a continuation of the "Star Wars" missile defence test programme that's apparently now been abandoned. The guide on our bus claimed, though, that this particular plane performed the only ever successful test shoot-down of a missile by an airborne laser gun. It sounded a bit too much like science fiction to me – but the plane I saw with my own two eyes did make me wonder. I researched the story afterwards and apparently they did indeed have one successful shot, but still not good enough to make the incredibly expensive system viable … Anyway, this unique machine was just undergoing preparation for storage at the AMARG base, its laser-gun nose already covered in the usual white …. The majority of planes you see are not quite so exceptional, though, and many are in various stages of being broken down, so it does look a bit like a gigantic junkyard in many places. In fact, our bus once even had to slowly follow a C-130 Hercules plane for a bit as it was being towed to one of the workshops, presumably to be stripped down and scrapped. Basically it is the sheer mass of planes that makes this tour so amazing – and quite an eerie sight it is too. On the one hand what is to be seen is merely the end of the lives of all these huge killing machines, but their sheer number serves as a reminder of the military might all this technology represents. That's the creepy bit, really. Although I suspect that most visitors do not really see it that way and simply enjoy the techie side of it all. Back at the Pima Air & Space Museum, it makes sense to pop in and get up really close to some of the aircraft in this setting too and unlike in the boneyard, you can walk right up and touch them! The museum's main asset is its huge collection of planes parked in the open-air area. But they also have a few hangars with themed exhibitions. A noteworthy exhibit to pick out is also the mock-up of a launching station, complete with dummies in German uniforms, for a V-1 flying bomb – the first pure "terror weapon", used by Germany for indiscriminate attacks on London in particular. The Allied counterpart, the massive aerial bombings of civilians in German cities such as Berlin (cf. also Dresden and Hamburg), is predictably portrayed in much more glamorized tones, esp. in the separate 390th Memorial Museum Hangar, which features a restored B-17, the main bomber type used by the USAF over Germany. Also interesting in these WWII sections, other than big hardware displays, are the sections about Allied POWs in Germany or the collection of anti-fascist propaganda trinkets. Another display of particularly dark interest are the artefacts salvaged from the USS Arizona that was sunk in the attack on Pearl Harbor. 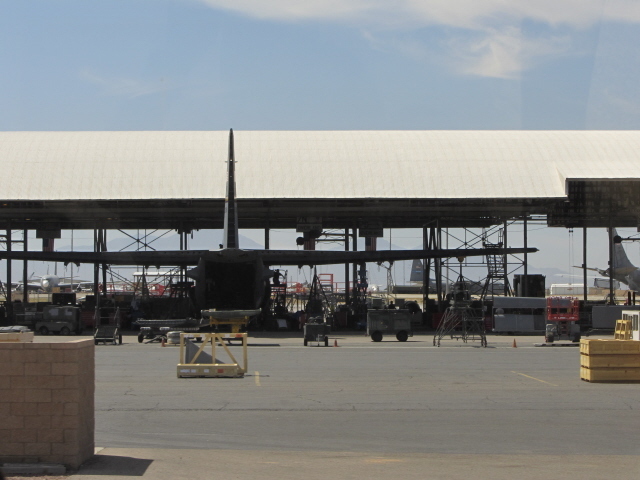 Yet another hangar is not as such open to the public, as it serves as the museum's restoration workshop, but you can peek in through a window. Next to this is a restored WWII barracks building with lots of model planes inside. The final hangar is the one that justifies the ampersand in the museum's name – i.e. it’s the Space Gallery. The big exhibit dominating the hall is a mock-up of a NASA X-15 rocket plane – an extreme type of aircraft which achieved Mach 6 speed and altitudes on the edge of space! Other items of note here are an Apollo training capsule, a ring-shaped meteorite and a small piece of moon rock. Of the vast number of planes displayed in the open-air part only a few can be picked out here. Visually the most dramatic ones are the three (!) 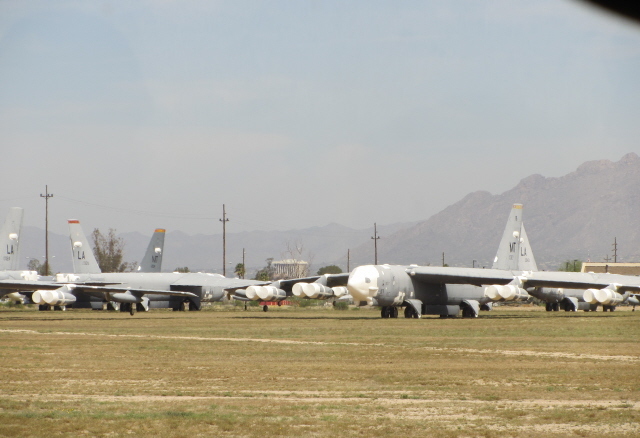 B-52s parked next to each other along the northern edge of the fence. Facing them is a rare B-36 Peacemaker strategic bomber (even larger in shape than a B-52) with its characteristically odd arrangement of six piston engines with rear-facing propellers. Even odder a shape is that of the Super Guppy plane used by NASA to transport sections of the Saturn space rockets. Other larger planes include former "Air Force One" presidential planes, including ones used by presidents Kennedy, Johnson and Nixon. Out of the countless smaller planes a few non-American ones stand out, including some Soviet MiGs and a European Tornado. There are also helicopters, both military and civilian ones. One has to be the oddest-looking one ever: the "flying crane" CH-54, which was originally developed for the military (and saw service in Vietnam) but was later appreciated for its heavy-lift capabilities in e.g. erecting electric pylons, or being a trusted helper in the logging and oil industries. Back to much darker aspects: apart from the various Cold War era strategic nuclear bombers, including a sleek B-58 Hustler, there's also a modern-day mobile missile launch group displayed between the Space Gallery and the main building. All in all, it's the 'boneyard' bus tours that really are the unique selling point for this museum, even though it also has what is certainly one of the coolest aircraft displays in its own right. From a particular dark tourism perspective, it is perhaps less of a crucial sight than the associated Titan Missile Museum, but it does have its Cold-War-scare-related aspects too – plus lots of smaller-scale "hot" war associations as well. In general, however, visitors should bring a certain general fascination with aeronautics in order to really get a lot out of both the museum and the 'boneyard' tour. Location: immediately to the east of Davis-Monthan Air Force Base, which is on the south-eastern edge of Tucson, Arizona, USA. The Pima Air & Space Museum's address is 6000 E. Valencia Road. Access and costs: quite easy for the museum part, more restricted in the case of the boneyard, which can only be seen by guided bus tours, and for these you now have to pre-register online in advance; reasonably priced. Details: the AMARG 'boneyard' can only be visited on bus tours that run weekdays from near the entrance of the Pima Air & Space Museum. Note: no tours on Saturdays and Sundays or on public holidays! You have to purchase your tour ticket and sign up for a tour at the museum's ticket desk, nominally at least an hour before departure. The ticket price, which comes on top of the admission fee for the museum, is 10 USD. When I was there a few years back, tickets were simply allocated on a first-come-first-served basis and coulnd't be pre-booked/reserved, you just turned up and joined one of the several tours departing over the course of the day. NOTE that this has changed. Now there are only tours at fixed departure times (11 a.m. and 2 p.m. when I last looked online in May 2018). More importantly: now you have to reserve in advance, a minimum of 10 business days in advance. Reservations start from 90 business days in advance, so better plan well ahead. You have to fill in an online registration form entering details from an official photo ID which you will then have to produce on site as well. For non-US citizens a passport is required. Further restrictions: no backpacks or other larger items, including camera cases, are allowed on the bus, not even – surprise, surprise – any kind of weapon/firearms … though that's less likely to be a restrictive issue for foreign visitors than it may be for locals. Nominally only small photo cameras can be carried on board, but I got away with both my little compact and my SLR – but no big zoom lenses will be welcome. So stick to a reasonably small-to-medium-sized universal type of lens. Any small bags that may be allowed on the bus are subject to inspection. But the regime was much more relaxed and friendly in nature when I went than all these regulations may make it sound. In fact, foreigners were specifically made welcome, and their nationalities were proudly announced by the guide during the approach drive to the boneyard (maybe to emphasize the international appeal of these tours?). During the tour you have to stay on the bus and there are no stops other than short halts for photos, which have to be shot through the windows. To get to the museum/starting point of the tours, you need a car. It's easiest to use Interstate 10 south of Tucson heading east towards Benson, Las Cruces and El Paso; take exit 267 to get onto E. Valencia Rd. Just stay on this road, going east, and you will soon see the row of big planes on your right that are already part of the museum. The entrance to the car park follows soon after, also on the right. The buses for the 'boneyard' tours depart from the roundabout right in front of the museum entrance. The opening times of the museum are: daily from 9 a.m. to 5 p.m. (last admission an hour before closing). Admission to the museum is 16.50 USD, reduced rate of 13.75 for seniors, and 10 USD for juniors between 5 and 12 (under 5-year-olds free) – in the past there were slightly lower rates charged in the blistering heat of the summer season, but I don't know whether that is still the case. The prices may sound a bit expensive – but you do get a lot for it … that is, as long as you are into planes and other aviation hardware. Then it's actually quite reasonable value for money. For those who really want to spend a lot of time here, there are also two-day rates on offer (22 USD for adults). Tours inside the museum ground are also offered, in particular 'tram tours' of the expansive outdoor area – these last one hour, with narration by a guide (extra charge: 6 USD; running about four times a day from 10 a.m.). Guide services in some of the hangars are available for free. But everything is really more or less self-explanatory. Time required: The bus tour of the boneyard takes about an hour to an hour and a half in total; at the museum you can spend anywhere between another hour and a half or a whole day, or even two days, depending on how much an aviation history buff you are. I spent a bit over two hours in the museum, mostly in the outdoors parts. But if you also want to read all the interpretative panels in the indoors exhibitions, then you will most likely need longer than that. Combinations with other dark destinations: The Titan Missile Museum outside Tucson is actually affiliated with the Pima Air & Space Museum, and indeed should be visited as well by any dark tourist passing through these parts. It is in fact a more decidedly 'dark' attraction in that you can not only see the missile and all the technology around it, but tours even include a run through a simulated launch sequence … that's about as dark as it can get, in the sense that a real launch would have surely meant World War Three, i.e. the end of the world, or at least of human civilization as we'd known it. In a similar vein, but further away, the other highlights of nuclear tourism in the USA are also mostly located in the South-West, such as the Atomic Testing Museum and the NTS in Nevada, or Trinity, Los Alamos and the National Nuclear Museum in New Mexico. Thematically closer to the AMARG 'boneyard' and Pima Air & Space Museum are the USA's other aviation and space museums – the very best of which is the USAF Museum in Dayton, Ohio. For yet more dark attraction in this vast country see under USA in general. Combinations with non-dark destinations: The city of Tucson itself also has several other attractions not related to the Air Force, such as acclaimed museums and art galleries, a lively university area and plenty of adobe architecture. However, it is a very sprawling city with hardly a proper downtown. Outside this and the university the car is king, as so often in the States. One of Tucson's and Arizona's prime attractions also requires a car to get there: the Arizona-Sonora Desert Museum to the west of the city (i.e. actually in the desert). Those in search of all the familiar Wild West clichés get catered for in the Old Tucson Studios, now basically a theme park. A more serious theme park is what used to be the "Biosphere 2" research facility, just north of Tucson, and now in the hands of the University of Arizona, and tours of the unique site are offered to the general public. Further afield but within a day's drive or less are some of the USA's most dramatic National Parks showcasing the South-West's scenery to the max – most of them, however, are in the north of Arizona. Amongst them are Monument Valley, the Red Rocks of Sedona, Canyon de Chelly, Petrified Forest, and of course the grandest attraction of them all: the Grand Canyon (see also under Barringer Crater). The neighbouring states of New Mexico and Utah offer yet more of the USA's stunning array of National Parks – far too many to list them all here.